The following article was featured in The Bangor Daily News on Wednesday, August 20, 1975. “Thank You” to The Bangor Daily News for providing us with a copy of the article in a timely fashion. MILO- The announcement this week that the American Thread Co. will begin phasing out the operation of its wood spool plant here presents an opportunity to tell the company’s story. In March of 1898, 13 independent thread and yarn manufacturing companies merged to form the American Thread Company. Included in their merger were the Willimantic Linen Co. of Willimantic, Conn. and the Merrick Thread Co. of Holyoke, Mass. These consolidated companies, which eventually made up the American Thread Company, used wooden spools which were manufactured in Egypt, Maine, by the Merrick Thread Company. Now a part of the town of Franklin, Egypt established its mills in 1883. Birch was conveniently located near the mill, but by 1888 the supply was becoming extremely scarce. A new location was needed. Land was cleared in the wilderness at the foot of Schoodic Lake. Preparations were made for a spool mill, overlooking this beautiful body of water in Lake View located in the southeastern section of Piscataquis County. 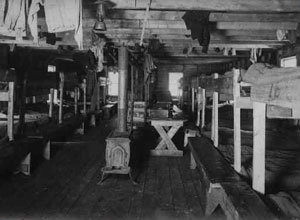 In 1890, the spool mill of the Merrick Thread Co. at Lake View was a modern structure, although the machines for manufacturing spools had not yet been installed. The manager of the mill, who constructed and operated it until 1908, was Frank W. Hamlin, who had previously held a similar position at the Egypt Mill. At this time, the Atlantic Division of the Canadian Pacific Railway had not been completed. Supplies had to be delivered to Lake View by team to a point on the lake shore about two miles above the mill, then known as “Gerrish Landing”. From here the goods were transferred by boat to Lake View. Later, the highway from Lake View to the county road at Highland Quarry was laid out and built. Each year 3,000 cords of white birch were required to produce work for a crew of 60 men employed at the mill. An additional 700,000 feet of lumber was used to construct shipping boxes for the spools. In 1892, the Merrick Thread Company turned out 69,500,000 single spools. When production at the mill first started, workers received one dollar a day and were unable to work during rainy weather, thus loosing their pay. Soon the town began to prosper. A boarding house, homes for company employees, and a general store were built. During the 1889-90 season the first birch lumber was felled in this area. Tranportation was conveniently located 150 feet away with the completion of the Canadian Pacific Railway. Lake View claimed a fire department and a medical department complete with a hospital, doctor and nurse. Expense for the treatment of an employee was taken care of by the American Thread Company and the employees, the latter paying 25 cents weekly. Barracks in the woods were provided for the log cutters. These camps were greatly improved from the early days. All meals were prepared by a competent cook. Menus included beef, potatoes, baked beans, breads, pies, doughnuts, cookies, tea and coffee. 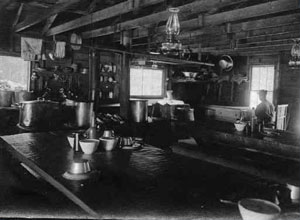 Replicas of these living quarters were found at Hardy Pond, Five Islands at Schoodic Lake, Patten, Medford, Kineo and Bowerbank. 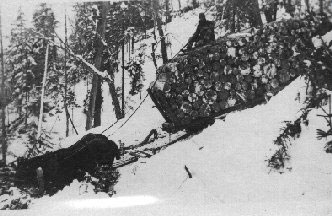 Since those early days, the methods of lumbering have porgressed from the axe and bucksaws when horses were used exclusively to transport wood to the mills, through the period of the log haulers, to the present when wood is harvested with chainsaws, skidders and trucks. The other partner in the merger, the Willimantic Linen Co. purchased a lot in 1879 near the head of Sebec Lake at Greeley’s Falls. The company built a mill on the north bank of Wilson’s Stream for splitting spool timber. The township was organized in 1881 and named Howard until 1883, when the name was changed to Willimantic after Willimantic Connecticut. There were 70 employees working for the Willimantic Linen Co. About 1886, a spool factory was added and the finished spools were turned out in Willimantic, Maine. The company built a mill at Elliotsville, near Lake Onawa, equipping it with machinery for sawing spool bars. This mill was run by electricity generated at Willimantic. The first electric generating plant and transmission line built in Maine was erected at Willimantic under the supervision of the company’s first general engineer, Samuel Green. Fine white birch was found in the area with an average quantity of 2000 cords being used a year. When the birch supply became exhausted in 1902, the spool mill was started in Milo. A group of about 40 of the Willimantic employees moved to Milo in 1903, when work started there. At this same time the Merrick Thread Company at Lake View was changed to the American Thread Co. In 1925 the Lake View Mill was closed and since that date, all spools have been manufactured at Milo.